Today I show you a miniature I have recently painted from a new wargame “made in Spain”: Punkapocalyptic, from BadRollGames. Related to classical themes observed in great movies such as Mad Max or Dredd Judge, Punkapocalyptic is a skirmish game with 30mm miniatures where different warband fight to take control the limited resources. At the moment there are three factions: Mutards, Gangers and the new one, Junkers. And surprisingly, we can freely download the rules to play this fantastic wargame (also in English!). 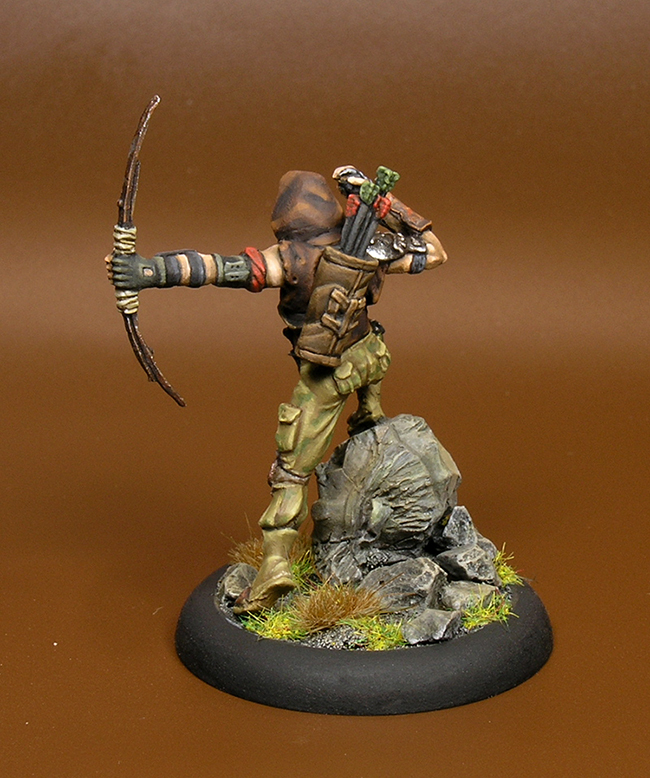 Thanks to a common friend, I got a Pandillero to paint it: the archer. In some way, it recalls me the Marvel character, Arrow. The quality of the model, as you can see in the pictures, is oustanding, including a superb rock face on the base. You should take a look at the whole miniature range in Punkapocalyptic’s website. The sculpts are marvellous. I have to say that I have never painted this kind of miniatures before, but it was a pleasure and a challenge. Instead of the color palette used by the oficial painter, I wanted to get a dark and dirty effect. After watching the new Mad Max movie trailer (the 31st time, maybe?) I decided to simulate an “oxidize” style. For example, the model has several metal parts, like the bow and protections, where I can easily simulate oxide with the sponge technique and several brownish and orange colors. To remark the metal origin of some of these pieces, I added a final light with Steel. I also imagined the pectoral armour formed by old tires fragment with a light greyish color. To finish these “oxide” effects, I painted the leather parts -belt and hoodie- starting by a very dark brown tone (dark oxide 302), and then I forced the lights with orange brown, after appliying an intermediate color like flat brown. About the trousers, I wanted to paint a simple camouflage. Finally I decided to use English uniform like main color and paint some small greenish stains. I’m happy with the result, but of course my “historical wargame” style is hard to adapt to this kind of figures. 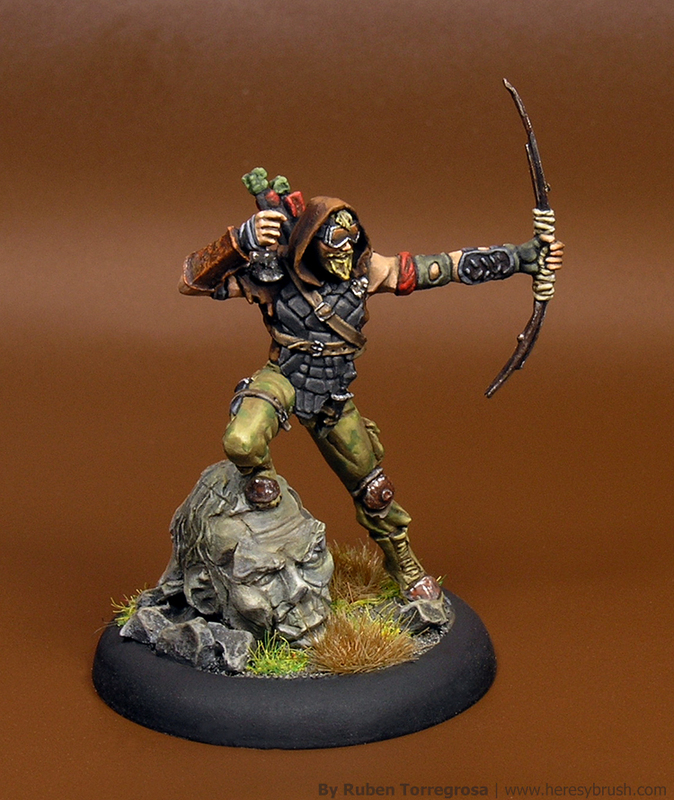 However, after painting this fantastic model, I want to continue working on this style and specially on these figures. I will prepare a Pandilleros warband to play Punkapocalyptic! Remember, don’t hesitate to visit Punkapocalypticsite, where you can download for free the rules and much more material and see the fantastic miniatures they are producing.